Should You Worry About Hurricanes in Hawaii? When you imagine your exotic, tropical Hawaii vacation, you probably AREN’T thinking about the fact that the islands are potential targets for hurricanes (or maybe you are). But, as an island chain in the middle of the Pacific Ocean, we are under constant threat of a direct-hit by a hurricane, especially during hurricane season, which lasts from June through November. According to The Weather Channel, Hawaii has been, and will be in the future, hit by hurricanes. The key, at least climatologically speaking, is the direction of the storm’s approach. Virtually all hurricanes in Hawaii and near the Hawaiian Islands since 1950 have approached from the southeast, south, or southwest. Why? Sea-surface temperatures are typically warmer south of the islands. In El Nino years, the trade winds that sometimes trap tropical cyclones well south of the islands relax, making these lingering storms south of the islands more susceptible to be drawn northward. But, remember, an El Nino does not guarantee a hurricane will impact Hawaii. On average, four to five tropical cyclones occur in the central Pacific Ocean basin (between 140-180 degrees west longitude) each year, according to Dr. Rick Knabb, director of the National Hurricane Center and former Hurricane Expert at The Weather Channel. About two-thirds of those systems come from the eastern Pacific basin. On average, four to five tropical cyclones occur in the central Pacific Ocean basin (between 140-180 degrees west longitude) each year. August is the peak month for tropical cyclones in the central Pacific basin, chalking up twice as many (74) as September (37) from 1971-2013, according to the Central Pacific Hurricane Center. Unlike the Atlantic Basin, July is the second most active month (45) in the central Pacific basin. The Weather Channel reports that the costliest hurricane in Hawaii’s history, Hurricane Iniki, originated in the eastern Pacific as a tropical depression Sept. 5, 1992 before it crossed over into the central Pacific Ocean basin. There, it became a tropical storm and eventually a powerful hurricane. Again, note that track was initially well south of Hawaii, before it curled north. The island of Kauai was especially hard hit by damaging winds. Along the southern coast, many structures were wiped out by storm surge flooding and large, battering waves. Other hurricanes that have had significant direct impacts on Hawaii in the last six decades were Nina (1957), Dot (1959) and Iwa (1982). 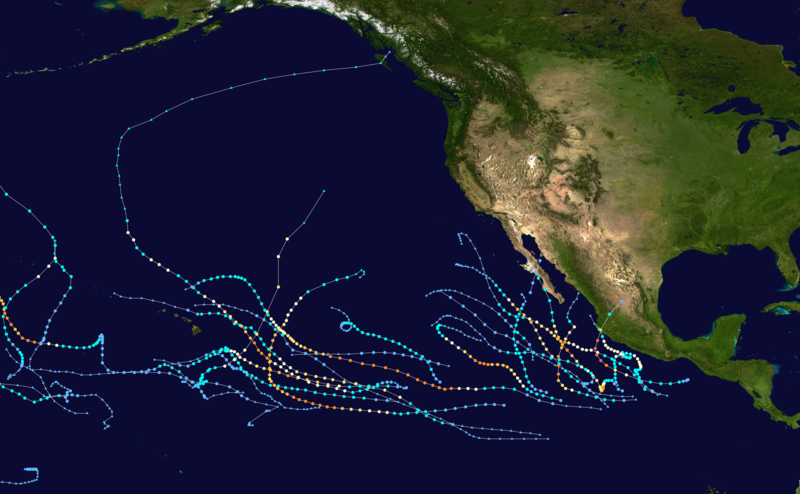 Iniki is the only one of the four that officially originated as a tropical cyclone in the eastern Pacific Ocean basin. It’s possible that Dot also originated in the eastern Pacific, but because of poor data over the oceans in 1959, this cannot be confirmed. 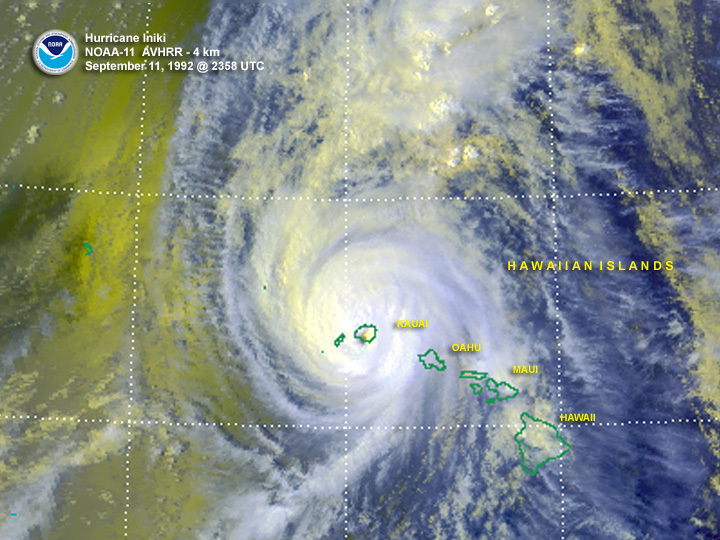 Hurricane Flossie in 2007 is an example of a tropical cyclone that originated in the eastern Pacific and was aimed at the Big Island of Hawaii before it weakened dramatically due to wind shear. Hurricane watches and tropical storm warnings were issued since Flossie was forecast to maintain hurricane intensity as it arrived in the vicinity of the Big Island. Thankfully, Flossie weakened quicker than anticipated, resulting in minimal impacts outside of high surf and winds to 39 mph. The costliest hurricane in Hawaii's history, Hurricane Iniki, originated in the eastern Pacific as a tropical depression Sept. 5, 1992 before it crossed over into the central Pacific Ocean basin. There, it became a tropical storm and eventually a powerful hurricane. Again, note that track was initially well south of Hawaii, before it curled north. Drier, more stable air from the subtropical high to the northeast of Hawaii eventually inhibits thunderstorms from persisting and remaining clustered near the cyclone’s center. Wind shear (the change in wind speed and/or direction with height) is typically stronger near the Hawaiian islands, acting to displace thunderstorms from the cyclone’s center. Cooler sea-surface temperatures in the Pacific waters to the east of the Big Island of Hawaii keep the air somewhat cooler above it, increasing the stability of the atmosphere, making it less susceptible to forming and maintaining thunderstorms. So, back to the title of our blog: Should you worry about hurricanes in Hawaii? The short answer is: No, don’t WORRY about a hurricane, but be aware that one could form, especially during hurricane season. And, if you’re concerned about what to do in the event of a hurricane in Hawaii, know this: Your Hawaii hotel will have contingency plans for guests should an emergency happen. So, go ahead, make your Hawaii vacation plans — and rest-easy knowing you’ll be in good hands should a storm come our way.